With his Formula 1 future still the centre of paddock rumour and gossip Nico Hulkenberg put aside the question mark hanging over where he will drive in 2014 to have a promising day at the Yas Marina circuit. The German, who has raced under a cloud of speculation for most of the year, looked confident throughout the day’s running and finished the day ninth fastest. 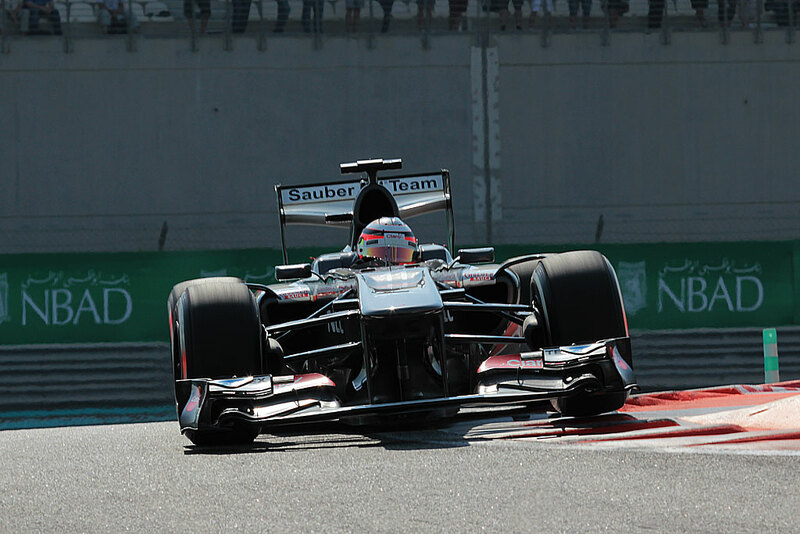 The Sauber driver was sandwiched by both Ferrari’s and trailed Fernando Alonso by one tenth of a second. The most likely option for Hulkenberg for 2014 appears to be a return to Force India but with options shrinking rapidly as the grid for next season takes shape it is clear that time is running out for the promising German. This entry was posted in Formula 1, News and tagged Abu Dhabi, Fernando Alonso, Force India, Hulkenberg, Lotus, Nico Hülkenberg, Pastor Maldonado, Sauber. Bookmark the permalink.